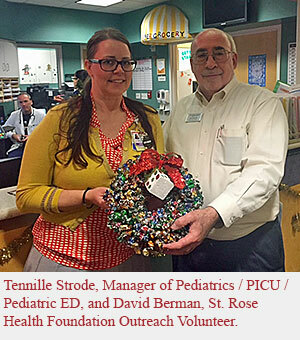 The wreath presented to Pediatrics at our Siena Campus is one of 15-20 made each year by Sun City Anthem resident Susan Marks, who donates them to area organizations such as hospitals,homeless shelters, veterans organizations, and child-welfare groups. Susan has been making these wreaths during the holiday season for more than 50 years. Each one weighs 7 to 8 pounds and contains more than 450 individually wrapped candies purchased in bulk. The process involves shaping and cutting a wire coat hanger and then attaching the individual candies to high-strength carpet thread wrapped around the hanger.